Suggested calibers are 270, 7mm, 300, 338 in magnum loads. In some cases, long range shots of 3-400 yards are necessary; however, most shots are in the 1-200 yard range (or closer). We recommend you bring 2 boxes of rifle shells (40 rounds). Quickly becoming a very popular means of harvesting game. The area of tundra we hunt has pockets of spruce, dwarf birch, outcroppings of rock along with natural ridges and ravines that allows the opportunity for animals to either come to you, or provide the ability to stalk your prey. Shooting lots of arrows in the 40-60 yard range confidently prior to your arrival is not only encouraged, but strongly suggested. 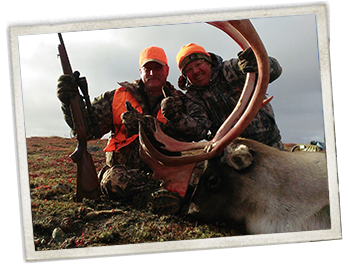 Because this is trip of a lifetime to many, most hunters bring both bow and gun (as a back-up). 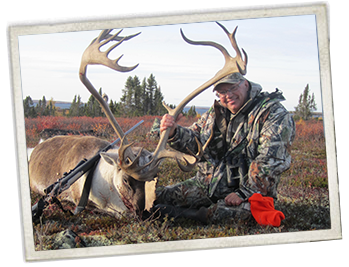 Another great option for taking your trophy Caribou, and one that is gaining in popularity. Because of airline regulations with the transport of black powder and caps, it is suggested that you make arrangements with us 45 days prior to your trip to have everything you need at the lodge when you arrive. We have a shooting range at the lodge to ensure your weapon is shooting accurately. Restricted weapons such as handguns are not permitted for hunting or self defence in Canada. Hunters entering Canada with firearms must fill out the appropriate Firearms Declaration Forms and be in possession of these when crossing the Canadian Border. Once your reservation is considered “firm”, we will provide all the necessary forms and guide you through this process. Blaze Orange – Hunter orange is a must when in the field. Jackets or vests must have a minimum of 400 sq inches of blaze above the waist, and a blaze hunting hat is also required. Wounded Animals – Depending on the circumstances, a wounded animal may count as a harvested animal. This will be left up to the discretion of the guide/outfitter.